Alice Dyson-Jones studied at the London College of Music, spending the last 20 years carving a career for herself from the music business, working first in CD manufacturing, Business Development, MArketing Manager and now Commercial Director at One Media iP a great, forward thinking independent music business. All of these experiences have give Dyson-Jones a unique point of view and insight into the music industry. She understands the need to nurture creativity educate, invest as well as continually look forward in order to navigate the challenges and shifts as new formats come and go and revenue streams are challenged. Dyson-Jones is focused on ensuring that the UK continues to punch its weight as one of the globe’s greatest creators and exporters of music. 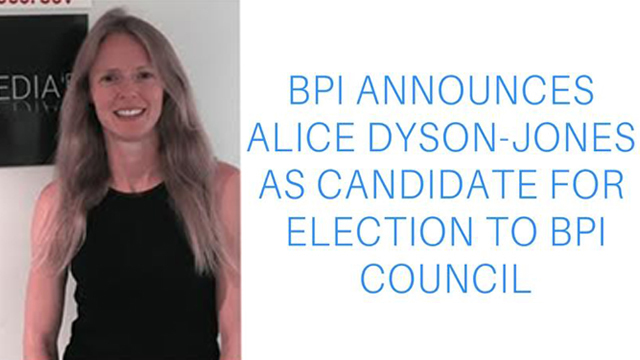 The Indie sector plays a hugely important role in adding to this diverse and eclectic melting pot, and as a council member Dyson-Jones will ensure Indies feel that their points of views are represented and that the BPI represents their needs as its trade body. As we turn a corner and forecasts begin to predict double -digit growth in our sector and as streaming takes a grip Dyson-Jones recognises the importance of building the right framework for the industry in the coming years as we plan for a future beyond the EU. Whilst there is growth in the industry, there is a mismatch between the value that services earn, and the revenue returned to us. The value gap is the biggest threat to the future sustainability of the music industry and Dyson-Jones will work to address this. To ensure we meet the challenges that the industry continues to face vote for Alice Dyson-Jones. Council election to take place at BPI’s AGM, 7th September, County Hall offices.